Black mustard is an annual plant; the many, erect, branching, angular stem grows 2-7 feet tall and bears large, alternate leaves, the lower ones lyrately pinnatifid and somewhat bristly, the upper glabrous, entire, and lanceolate. Yellow flowers grow in elongating clusters in terminal racemes from June into November. Each has 4 petals. The black seeds develop in upright, bulgy, cylindrical, beaked pods which are held on stalks closely pressed to the stem. Very similar to black mustard. Widely cultivated and also found wild in many parts of the world, including the fields and waste places of North America, except the far northern parts. 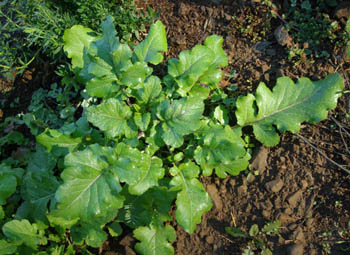 Both black and white mustard have similar properties, although most herbalists say the black mustard is the stronger. Culpeper recommended an external use to treat joint pain and backache. To be taken internally with honey for coughs. Today, mustard is generally used externally. Never use the undiluted oil. 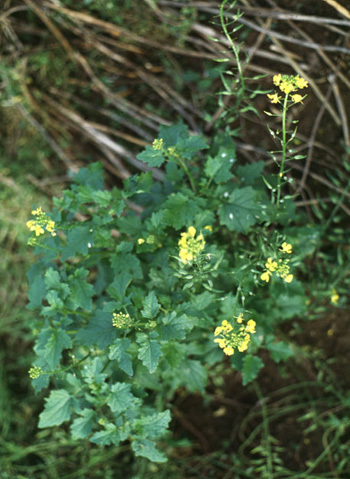 There is a wild weed mustard, called “Acjha.” Grows on hillsides and is ripe in late June. The seeds are small and red. Use of the seed is thought to have dated back to the time of the Greeks, who also used the plant’s green leaves as a potherb and salad. Some references say Black Mustard belongs to the mustard family, but Webster’s dictionary and the majority of references claim the crucifer family. The reader knows best. Black mustard seed is used for giving a biting sensation to cordials and wines. This is the common yellow (white) ground mustard that is used with food, even though some herbalists claim it is harmful used in this way. The leaves of the white mustard are quite tasty in salads. Black mustard is generally used externally as an irritant to encourage blood flow toward the surface in cases of rheumatism, sciatica, peritonitis, neuralgia, and various internal inflammations. Black mustard can be taken internally in very small amounts to promote appetite, and stimulate the flow of gastric juices. In poultices to treat colds, fever, bronchitis, ague, sciatica, crick in the neck, chilblains, relieve constipation, or to promote kidney action, toothache, headaches. In stronger doses it causes vomiting. Mustard oil can be mixed with rectified alcohol (1 part oil to 40 parts alcohol) and used as a lotion externally for gouty pains, lumbago, and rheumatism. Also used as a spice, a condiment, leaves in salads, cooked as a vegetable, season pickles, etc. Ground seeds used as a snuff for headaches. An old-fashioned remedy to produce vomiting. Used as a poultice for pneumonia, bronchitis, chest colds, and flu. The seeds are used to treat joint pain, watery, oozing, chronic sores, stops coughs, dispels phlegm, improves digestion. Plaster: Mix mustard powder with cold water to make a thick paste, then spread the paste on a linen cloth. Put a layer of gauze over the affected area and then lay on the mustard cloth. The skin will begin to burn. Leave the mustard in place until the burning becomes too uncomfortable. Thoroughly clean any remaining mustard paste from the skin. Powder the skin with rice flour and wrap the area with dry cotton. The skin should be back to normal in a few days. Do not use on sensitive areas. For persons with sensitive skin, mix the mustard powder with rye flour to reduce its effect. Mustard plaster: mix 1 part mustard with 4 parts whole wheat flour. Make into a paste by mixing with warm water. Make it thick enough to spread on a cloth. If the mustard is very strong, it may blister the skin. When the burning becomes too uncomfortable, it should be removed. After it is removed, cleanse the skin thoroughly. If you wish to leave the plaster on longer, it can be made weaker. Mix the mustard and flour with the whites of eggs instead of water and it will not blister the skin. Allyl isothiocyanate (responsible for mustard flavor) is a strong irritant. May blister skin, red, burnlike skin blotches, sometimes developing into ulcers. Large amounts or prolonged use of black mustard, internally or externally, can cause serious irritation and inflammation; never let undiluted mustard oil contact the skin. Black Mustard must be used in small quantities and for short periods. Mustard seeds should not be used if there is a fever condition.